Of all the cuisines of Africa, the most fascinating to me is the one that evolved in Ethiopia and its neighbor, Eritrea. More than 30 years ago, Blue Nile in Virginia-Highland introduced Atlantans to the practice of scooping up spice-laden stews with injera using their hands. Since then, Ethiopian restaurants have multiplied here. We may never reach the saturation point of Washington, D.C. or Los Angeles, but the recent opening of Feedel Bistro in Briarcliff Woods, across the street from Desta and next to Bahel in a healthy pocket of East African culture, is a big step forward. The Eritrean family behind Feedel Bistro owned a similar concept in Virginia, and they serve beautifully plated food in a refined room. 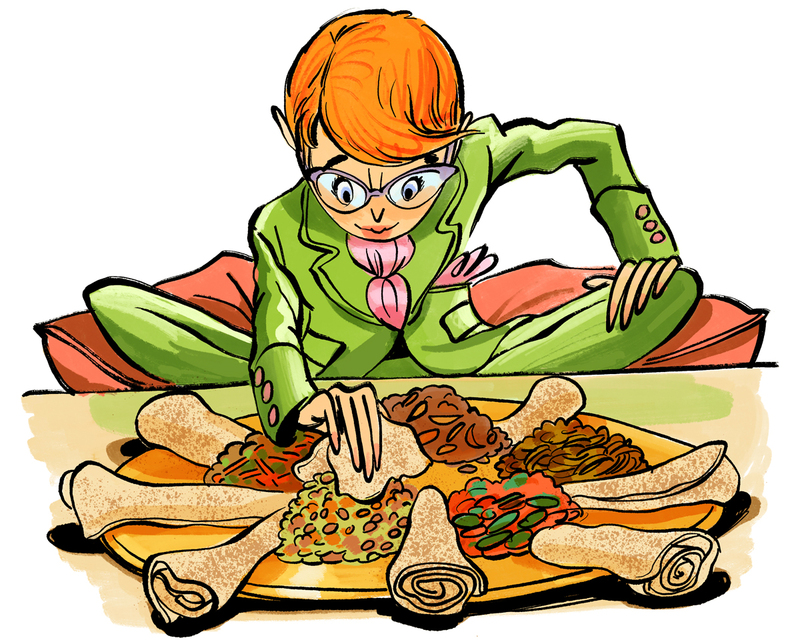 Most Ethiopian restaurants send out their dishes with beige, dull injera that’s made mostly of wheat. Feedel’s injera is made almost entirely with teff, an ancient, ultrafine grain with a more assertive, sour flavor and a darker, more appetizing color. Tiny holes known as “eyes” dot the surface of what’s essentially a fermented, gluten-free pancake. Two of the cuisine’s main spice mixtures, berbere and mitmita, combine ground dried chilis, ginger, cardamom, coriander, and garlic, among other ingredients. The fragrant red powders season kitfo (minced beef with homemade cheese, collard greens, and a rich, spiced butter), cubed lamb, and a world of lentils, chickpeas, and split peas. Unlike many Ethiopian restaurants, Feedel Bistro cooks all of its vegetable dishes without butter—which, along with that glorious gluten-free pancake, makes it an accommodating choice no matter your aversions or restrictions. Feel free to ask for a spoon to collect the last bits of flavor-soaked injera from the communal platter, and don’t be embarrassed to request that your food instead be served on an individual plate if that’s more your style. You’ll find centrally located ethnic enclaves such as Little Italys, Chinatowns, Koreatowns, and Japantowns in New York, Los Angeles, San Francisco, and Boston, but they’ve never been Atlanta’s thing. Our arterial, sprawly nature and our relatively recent influx of immigrants have spared us the embarrassment of specific populations being confined to neighborhoods with features such as dragon gates, pagodas, and red lanterns. If you drive Buford Highway from beginning (near the Lindbergh MARTA station) to end (near Lake Lanier), what you’ll see instead is an intermingling of communities—Mexican, Vietnamese, Chinese, Korean. Atlanta of course has pockets of various cultures, such as Indian here and Ethiopian there. Mexicans and Guatemalans flock to Plaza Fiesta and Taiwanese to the Chinatown Mall food court. But, basically, everyone reckons with everyone else. Bhutanese and Somalis, Burmese and Sudanese do business cheek to jowl. This particular melting pot is a good thing. The problem is that the globally diverse restaurants where I most want to eat are getting farther and farther away. I’d grown accustomed to having to traipse to Norcross, Duluth, and, at the other end of the geographic spectrum, Jonesboro to find the best Korean bone broth, Chinese specialties from the province of Harbin, and Oaxacan tamales. But now I’m having to travel to, say, Suwanee (home to the brilliant tlayudas at La Mixteca) or Johns Creek (where Ari Korean Steakhouse injects high style into the Korean barbecue experience). At the risk of coming across as lazy, I admit I find it difficult to explore the distant new shopping centers where second- and third-generation chefs are opening canon-expanding restaurants. These restaurants are more modern than those of the chefs’ parents and grandparents—and, as selfish as it sounds, I wish this next wave of talent was migrating inward rather than outward.